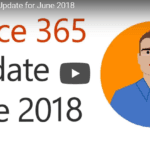 This article will cover a quick overview of the Microsoft Office 365 for June 2018 updates. The first step to making use of monthly or periodical updates is knowing that they exist. Updates simply provide new capabilities to your software or make improvements on the already existing ones. This article will cover a quick overview of the Microsoft Office 365 for June 2018 updates. The first step to making use of monthly or periodical updates is knowing that they exist. Updates simply provide new capabilities to your software or make improvements on the already existing ones. The challenge is thus having the knowledge on how they work. In a business organization, it would be an expensive affair to conduct employee training every time there is an update. The good news is that Microsoft has already taken care of that. On May 21st it launched the Microsoft Training Service, which is basically a digital customized service for Office 365 and Windows 10. The classes are designed to help customers learn about the new updates without having a financial impact on management. The pre-pilot phase of this program has been undertaken by twenty-five organizations to help leverage training which includes customizable up-to-date content, right-sized experiences to an organization’s needs, and consumption tracking. These new services by Microsoft will be available as a pilot program in late July 2018. Be on the lookout. Those interested need to register at Microsoft Training Services Pilot. Outlook features across MAC, Windows, Web, and mobile devices help you manage your time better. Finding a location for your meeting is made easy. When you go to Outlook, before typing your location, it gives you a list of suggestions such as the last meeting, recently used conference rooms, and also common locations. Once you start to type in the location field, Outlook brings up a list of suggestions that are powered by Bing and then finally completes your location with necessary information including full addresses for public locations. This Outlook service is even better if you are using an iPhone Operating System because it will use your current location, your destination address, and traffic updates to send you notifications on when you should be ready to leave for your next meeting. This amazing feature will soon be coming to windows. It is now possible to know who has been invited and who is attending a certain meeting. Outlook allows you to see the tracked responses and RSVPs for meetings that you have been invited to. This way, it is easy for you to decide whether or not to go. Sometimes two meetings may overlap. Someone else in your organization may already be going. You can choose to attend the other meeting and then sync up with your colleague later. This is very important as it makes time management a much easier task. Outlook has added more features on the Time Zone functionality that will help you plan meetings at optimal times across different time zones. It is now possible to display up to three time zones on your Windows calendar. This way you are able to see what is happening in other locations. Several features were launched at the May SharePoint Conference in Las Vegas for both SharePoint and OneDrive. There were new improvements on the built-in scan feature in OneDrive for both iOS and Android mobiles. These are accessed through the dedicated icon in the tab bar. That makes it easy to add images, annotations, and even multiple pages to your OneDrive. Now it is possible to automatically upload videos and photos captured on your camera roll in upload for Business OneDrive. There is also another great improvement that gives users the ability to require and set a password when you share a folder with other people. This feature basically prevents others from accessing your files if your intended recipient accidentally forwards a link. These new features now give you the ability to stop other users from downloading files or documents shared through the view-only links. These are basically immersive, mixed reality experiences that enable users to view and interact with content from every angle. In addition, users can visualize and manipulate data and product models in real-time. It is now easy to quickly change your current document’s title, open the document’s location, share the document through an invitation link, and even access the document’s version history by simply clicking on the title bar and selecting the functions from a drop-down menu. Office 365 solutions ensure that you identify and manage personal data such as the prevention of data loss and advanced data governance. The New Office 365 is able to detect and protect against security threats. It helps users comply with the European Union Privacy law recently enforced, the General Data Protection and Regulation (GDPR). To learn more about these helpful new changes, please visit: The Microsoft Blog.